Take I-94 West to the State Street exit (Exit 177). Turn right (north). Continue on State Street approximately 2 miles to the main campus area. Take I-94 East to the State Street exit (Exit 177). Turn left (north). Continue on State Street approximately 2 miles to the main campus area. Take US-23 North to the Washtenaw-"Ann Arbor" exit (Exit 37B) and merge onto Washtenaw. At the fork in the road where Stadium Blvd and Washtenaw split (approximately 2-3 miles), stay to the right on Washtenaw following the Hospital signs. Take a left at Hill Street (you'll see "The Rock"). Continue down Hill Street (campus buildings will be on your right). Take a right on State St. and continue two blocks to the central campus area. Take I-75 South to US-23 South to M-14 WEST. Take Exit #3, called Downtown Ann Arbor; this will become Main Street. Follow Main Street to William Street. Take a left at William Street and continue down William Street until it ends at State St. and the central campus area. Take I-96 East to US-23 South to M-14 WEST. Take Exit #3, called Downtown Ann Arbor; this will become Main Street. Follow Main Street to William Street. 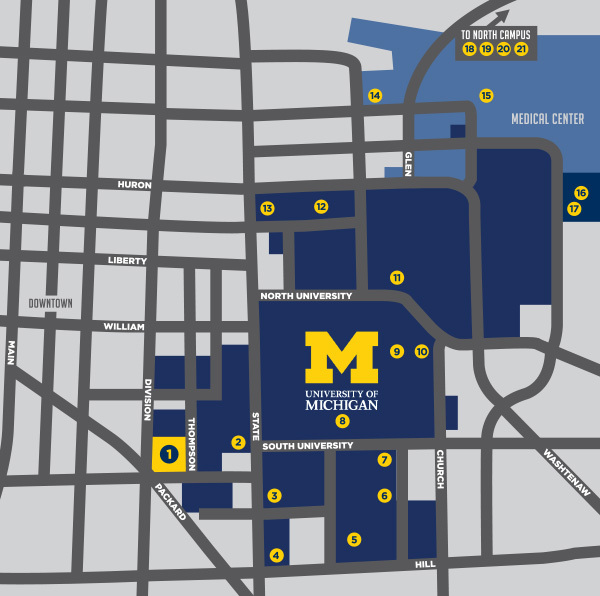 Take a left at William St. and continue down William Street until it ends at State St. and the central campus area. Take I-696 to I-275 South to M-14 West. Follow the M-14 West signs closely. Take Exit #3, which is called "Downtown Ann Arbor", this will become Main St. Follow Main St. to William St. Take a left on William and follow until it ends at State Street and the central campus area. Take I-96 to M-14 West. Follow M-14 West signs closely. Take Exit #3, which is marked "Downtown Ann Arbor"; this will become Main Street. Follow Main Street to William Street. Turn left on William Street and follow it until it ends at State St. and the central campus area. From Detroit and Metro Airport (heading West) Take I-94 West to US-23 North (Exit 180). From US-23, take Exit 41 (Plymouth Road). At the end of the exit, take a left (west) onto Plymouth Rd. Go approximately two miles and take a left onto Murfin Road (there's a BP gas station on the right). (Easiest way for directions, but also longest) Take I-94 East to US-23 North (Exit 180). From US-23, take Exit 41 (Plymouth Road). At the end of the exit, take a left (west) onto Plymouth Rd. Go approximately two miles and take a left on Murfin Road (there's a BP gas station on the right). Take I-94 East to M-14 East (towards Plymouth) to US-23 South (follow the signs carefully). From US-23, take Exit 41 (Plymouth Road). At the end of the exit take a right (west) onto Plymouth Rd. Go approximately two miles and take a left on Murfin Road (there's a BP gas station on the right). Take US-23 North to Exit 41 (Plymouth Road). Turn left (west) off the exit onto Plymouth Rd. Go approximately two miles and take a left on Murfin Road (there's a BP gas station on the right). Take I-75 to US-23 South (follow the signs carefully). From US-23, take Exit 41 (Plymouth Road). Turn right (west) off the exit onto Plymouth. Go approximately two miles and take a left on Murfin Road (there's a BP gas station on the right). Take I-96 East to US-23 South (follow the signs carefully). From US-23, take Exit 41 (Plymouth Road). Take a right (west) off the exit onto Plymouth. Go approximately two miles and take a left on Murfin Road (there's a BP gas station on the right). Take I-696 West to I-275 South to M-14 West to US-23 South. Take Exit 41 (Plymouth Road). Turn right (west) off the exit onto Plymouth Road. Go approximately two miles and take a left on Murfin Road (there's a BP gas station on the right). Take I-96 to M-14 West to US-23 South. Take Exit 41 (Plymouth Road). Turn right (west) off the exit onto Plymouth Road. Go approximately two miles and take a left on Murfin Road (there's a BP gas station on the right).